One of the best ways to keep grass vibrant on the surface and healthy down into their roots is to fertilize. Fertilization is important to giving your lawn the proper nutrients it needs to thrive through out the year. Proper fertilization is a balance of what your soil is giving your lawn and what you can add to it. 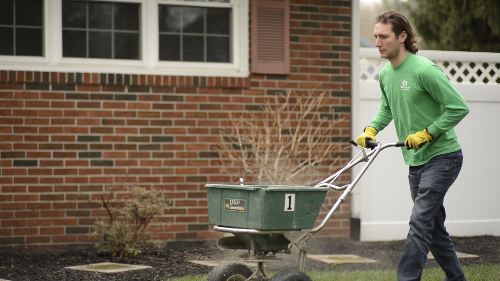 It’s important to hire professionals to apply fertilizer at the right time of year and at the right amount. 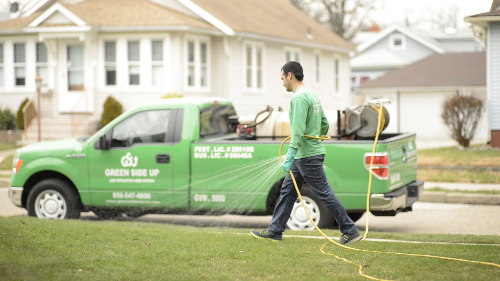 Green Side Up’s lawn fertilization and weed control program consists of 6 visits to your property to apply fertilizer and weed controls. While we are there we will diagnose any disease or insect activity and any other perils that may affect your lawn. Green Side Up will provide complete instructions and details of all products applied to your lawn along with safety measures. Green Side Up will also give you a newsletter detailing anything Green Side Up feels you should know pertaining to the season. This application is designed to spot control any post emergence of weeds and provide fertilization and nutrients necessary at this time of year. Additional nutrients will be added to this application to limit the affects of heat stress on your lawn. It is extremely important that lawns be aerated and seeded at this time of year. You will get full written correspondence of our recommendations as we approach this season. For those who choose to Aerate & Seed – we will apply a granular fertilizer to assist seed germination while providing nutrients necessary for the existing lawn. Any weed population will be sprayed at the time of service. For those who do not Aerate & Seed – you will receive a liquid fertilizer appropriate for the season as well as the liquid weed controls necessary. This application is designed to give your lawn the nutrients necessary to sustain it thru the winter months. No weed control due to the time of year.